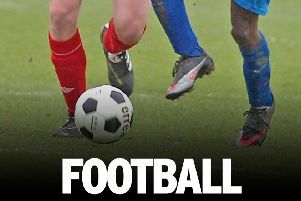 Morpeth made it eight league wins on the spin by defeating a spirited Lincoln United side at Craik Park on Saturday. The game was decided in the 69th minute when David Carson curled home the winning goal. Morpeth started the game on the front foot and Tom Potter flashed an effort wide of the far post when he cut inside from the right wing. Sean Taylor was next to try his luck but his effort from Liam Henderson’s cross was volleyed wide with Michael Emery in the Lincoln net beaten. The decisive moment of the first half arrived in the 21st minute. David Carson latched onto a long ball and raced clear of the defence before being brought down by Emery in the box. The referee gave the penalty and cautioned the ‘keeper. Sean Taylor took the spot kick but his effort was pushed away as Emery made amends for his error. Matthew Cotton had the first effort for the visitors but he blasted his effort over the bar when well placed. Cotton almost made up for missing that opportunity when he got on the end of a cutback from Thomas Garrick who had done well down the right. The strike from Cotton lacked power and was straight at Dan Lowson who held it with ease. David Carson was denied on 31 minutes when his powerful effort beat the dive of Emery but Sean Wright was on the line to head the ball clear. The Whites had the final opportunity of the half when Lowson had his fingertips stung by left back Scott Matthews who had advanced. Michael Turner was on hand to hack the ball off the line with Garrick lurking for the rebound. Morpeth began the second half as they had begun the first by being on the front foot. They had a hat trick of chances at the beginning of the half. Firstly, Danny Carson sliced the ball wide when presented with the ball from a corner. Taylor then couldn’t quite direct a header goalwards before Turner stabbed the ball over from Ben Sayer’s free kick. The game turned on a minute midway through the second half. Michael Jacklin volleyed home for the visitors but it was adjudged to be offside. Morpeth countered and took the lead in emphatic fashion. David Carson received the all on the edge of the area before working space before whipped the ball across the diving Emery and into the top corner. Taylor went close to doubling the lead when Tom Potter slipped the ball through to him but his dinked effort was dealt with by Emery. 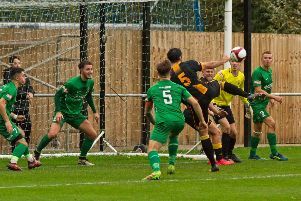 Lincoln kept pressing for an equaliser and went close with a towering header from Jacklin, whilst Matthew twice dragged efforts into the side netting in the closing stages and Robert Norris chipped effort was just off target.